John Ott has been performing and teaching cello lessons and music theory in Irvine, CA for almost two decades. He received a Bachelor’s Degree in Music Performance in 2004 from UC Irvine, where he studied with Dr. Margaret Parkins, and recently returned from a two-year excursion to Boston to complete a Master’s degree in Early Music in 2016 at the Longy School of Music, where he studied with Jane Hershey and performed extensively on both cello and viola da gamba. As a performer, he has played in Symphony Irvine, Dana Point Symphony, Montage Civic Orchestra, South Orange County Chamber Orchestra, Elegie Quartet, and he currently performs regularly with l’Esprit Baroque, an ensemble that performs Baroque music on period instruments. He has taught at Wildwood Music Camp, Arrowbear Music Camp and Chamber Arts Fest, and is employed by University and Woodbridge High Schools as a cello coach. 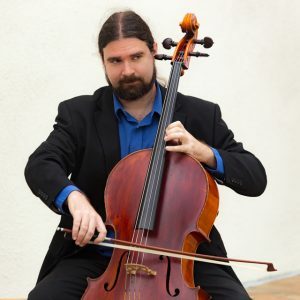 In addition he has been teaching private cello lessons in Orange County since 2000, and has been cello and music theory faculty and Assistant Director of Vienna Music Institute since it opened in January, 2006.